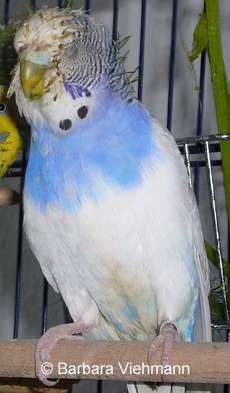 Many parrot birds such as budgies can be affected by a disease which causes vomiting or regurgitating their food. Sometimes the vomit consists of dry seeds and grains, but in most cases the birds throw up a mixture of half-digested food and an acidic liquid. This liquid can show different colours from brownish to yellow or whitish; the smell can also vary from rotten to fishy or sour. There are several possible reasons why a bird can show the above mentioned symptoms. So if someone is talking about a "sour crop", this is much too simple. In fact, it's a generalisation which could cost your bird's life in the worst case. As you will see in this chapter, it is necessary to find out the individual cause for the symptoms in each case. Some of the reasons mentioned below are no typical infectious diseases. But since they cause vomiting which often is associated with an infection, they are also described on this page. These are some of the most frequent causes for throwing up food in budgies. Please note that in other bird species, some of the mentioned causes of disease do not appear quite often. A video you should have a look at: On Youtube you can find a video which shows a budgie who suffered from a bacterial infection. Therefore the bird was vomiting. Of course the owner took the bird to an avian vet and the sick budgie got help. Please click here for the video . Many parrot species show a typical behaviour: Male birds regurgitate food from their crop and give it to their partners. Also some male birds feed their male friends; female birds in general do not feed their partners or even other flock members except from their chicks. For a bird, feeding a partner is very important. This behaviour shows the ability of raising a family and is a sign for a perfect health status. Also pairs get familiar with sharing the food that way which is important for the breeding season. While the female stays in the nest to warm the clutch or the hatched chicks, she needs to get food from her partner, and so do the chicks. So feeding a partner or a chick has nothing to do with any crop disease and is no sign for an illness at all. 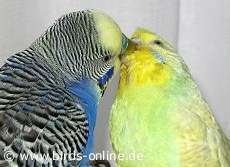 Regrettably, many budgies are still kept solitary, even though they are social birds who need other budgies around them. In many cages of these lonely birds one can find toys like plastic birds or tiny mirrors. Here in Germany, an association of vets has declared them as dangerous and contrarious to animal welfare. 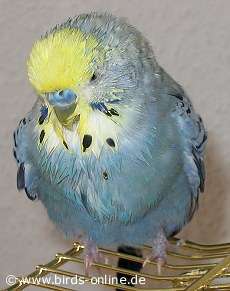 Especially male budgies who are kept as single birds tend to feed mirrors. They think that they see a potential partner and they offer him food which is part of the natural courtship (see above). But the mirror image won't take the food, so the bird swallows it again, then regurgitates it, offers it to the "partner", swallows it again, and so on. As you can imagine, the mucosa of the crop becomes sore after a while, vets talk about a crop irritation. Birds then suffer from sickness and pain; some of them throw up food. In our surrounding, you can find bacteria and other germs that normally won't harm us or our pets. But once the mucosa of a bird's crop is sore, these germs have a walk-over. The result is an infection of the crop that can be caused either by bacteria or fungus. 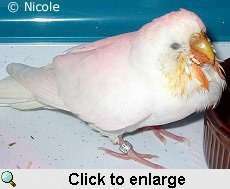 Most parrot birds love to gnaw on anything that's within their reach. If a bird swallows for example a piece of plastic or wood, it can become stuck in the crop and hurt the mucosa. This mechanical irritation of the tissue can lead to severe infections and vomiting. Budgies and other birds are fairly curious. While they explore our homes, sometimes they find things that are poisonous such as exotic plants. Since parrot birds gnaw on these things, a poisoning can be the result. Some plants or essential oils cause mucous membrane irritations. Birds who suffer from a poisoning often throw up food, but not in each case you have to deal with an infection of the crop. Also food intolerances can lead to vomiting. Rotten food or human snacks are not suitable for birds. 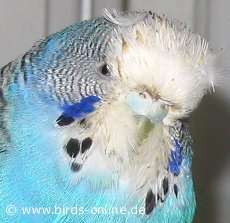 For example, a budgie can show severe vomiting after eating French fries or other fatty food. Please do never offer your budgies human food except from fresh fruit or vegetable, boiled rice (unsalted) or boiled potatoes (unsalted). For further information about budgie nutrition, please visit the chapter about this topic. Under certain circumstances, bacteria that are typical for our natural surrounding can harm birds, even though in general they won't do so. If the immune system of a bird is weak or if the crop is irritated, these infections can occur. The infected tissue swells and produces mucus. Also the tissue hurts and the affected bird loses appetite. In many cases, birds try to get rid of the liquid inside their crop by throwing it up. Right after vomiting, the bird shakes its head and the liquid sticks to the feathers on the head and in the face (see photo on the right). You can also find the liquid close to where the bird is perching, it's sticking for example to the cage bars or to the perches and swings. Besides bacteria, other germs can harm our pet birds. Yeast infections can occur, and it happens quite often due to a mucous membrane irritation. In many cases yeasts are responsible for the health problems, vets talk about a thrush or Candidiasis. Also pathogens from the genus Mucor can be responsible. Such crop infections can lead to vomiting and general illness. The affected birds suffer from pain and lose their appetite. You can find liquid sticking to their feathers after they threw up their food. There is another pathogen that can cause crop infections. When it was discovered, it was called Megabacteria, but today we know that it's a fungus-like organism and the name is a bit confusing. Many people therefore talk about Avian Gastric Yeast. The problem is: Vets aren't always able to find Megabacteria when they examine a crop swab. It often takes two or more examinations to detect the germs. They cause a disease that is called going light or wasting disease. Another possible cause for vomiting is a parasite infestation of the crop. 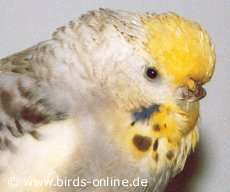 In budgies, the so-called avian trichomoniasis occurs quite often. Trichomonas is a protozoon and can kill a bird. The liquids birds throw up often smell fishy. This disease is highly contagious and all birds of a flock have to be treated. When parent birds feed their chicks or when adult budgies feed their partners, Trichomonas is transmitted. It also survives in the drinking water. Once an infected bird drank from the water, other flock members can be affected, too. A bird's brain and central nervous system (cns) are located inside the head; the cns is also located in the spinal cord. Like in humans, in birds the cns is responsible for the regulation of several processes inside the body. A head injury can therefore damage the cns what often leads to vomiting. Those who ever have been concussed know how terrible the vertigo and sickness feel. This is exactly what a bird goes through. Furthermore, some toxic substances can affect the cns and lead to vomiting or disorientation. Kidney diseases also can cause poisonings and therefore make birds throw up their food. It's sad to say, but it's the truth: Many budgies tend to develop tumours, and scientists don't know the reason for this so far. Often, the inner organs such as the liver or the kidney are affected. In both cases the organs do not detoxicate the body like they should - therefore birds often show signs of a poisoning like vomiting. When a tumour grows, it displaces the digestive tract of a bird what could lead to digestive tract problems. What can we do to help our birds? When you notice that your budgie or other pet bird throws up liquid and food, you should take the bird to an avian vet as soon as possible. The vet should try to find out whether you have to deal with a fungal or a bacterial infection or any other cause for vomiting. It's often advisable to take a crop swab and culture. If the vet won't find any hints for an infection, it might be a good idea to x-ray the feathered patient. Also a blood examination can sometimes be useful to find out for example if the bird suffers from a heavy metal poisoning, a kidney problem or a liver disease. Do sick birds need a special diet? Birds who feel sick lose their appetite. Therefore it makes sense to offer them food that is easy to digest. Half-ripe millet sprays are fine, also soaked seeds and boiled rice (unsalted). In case a bird suffers from a fungal crop infection, the food should not contain sugar because the germs feed on it. So during the treatment, birds are not allowed to eat fresh fruit or titbits such as crackers. Please ask your vet about the special needs of your sick birds and make the doctor tell you more about the diet that's good for your budgie.